I made a tajine for my Father’s Day dinner to go with my Moroccan lamb. I had a zucchini on my counter that I wanted to use before it spoiled, but I thought that a soft squash like this would not stand up to the long cooking time of a tajine. I decided it would be much better barbecued separately. Since I had already blended Ras el Hanout for the lamb it seemed an obvious spicing. 1. Cut the ends off of the zucchini and cut them in half length wise. 2. Use a sharp paring knife to cut scores every half of an inch on the cut side of the zucchini. Tip: Try not to cut the skins of the vegetables when you are making your scores. Use the tip of the knife to cut deeply into the flesh at the thickest points, but try not to end up chopping the vegetables into bits. 3. Sprinkle salt on the cut side of the zucchini and rub it in to evenly distribute it over the surface. Tip: The salt will draw out the squash’s moisture and give the spice something to stick to. 4. Let the zucchini rest for 5-10 minutes to draw out the moisture. 5. Sprinkle the Ras el Hanout over the cut surface. 6. Place the zucchini, cut side down, directly over the coals and close the grill. Note: I was barbecuing lamb at the same time. When I moved my lamb to the cool side of the barbecue I put the zucchini on. 7. After 15-20 minutes, turn the zucchini skin side down and barbecue for another 10 minutes. Tip: How long this takes depends on how hot your coals are at this point. 6. 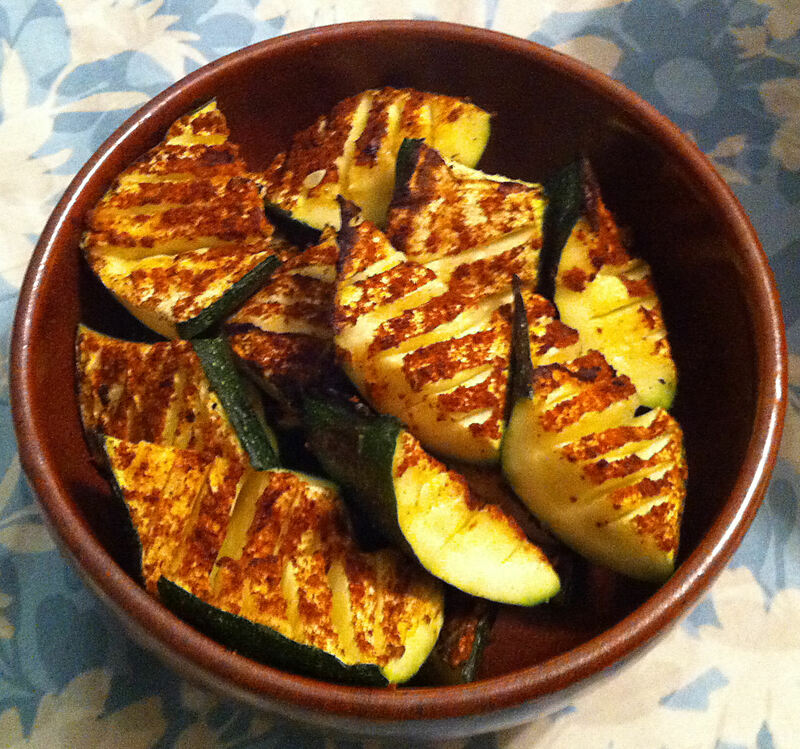 Remove the zucchini from the grill and cut it into 1½ inch pieces and transfer them to a serving plate. Tip: The cut side will be very decorative, so place the zucchini cut side up on the dish.